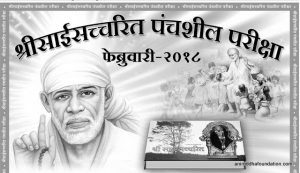 Shree Sai Satcharit authored by Shree Hemadpant is an infinite treasure filled with tremendous and invaluable strength for all Sai bhaktas (followers). Shree Sai Satcharit, authored by Shree Govind Raghunath Dabholkar alias, ‘Hemadpant’, by the grace of Shree Sainath, is a great guide for all the Shraddhavans. Moreover, it also is an invaluable, everlasting treasure of worldly as well as spiritual thoughts and experiences. The following verse from ‘Chapter 50’ of Shree Saisatcharit reiterates the same meaning. Many were highly astonished when Sadguru Shree Aniruddha announced to conduct Panchasheel examinations based on Shree Sai Satcharit. ‘How will this exam be?’, ‘What could be its nature?’ and ‘How much response would it receive?’ were several questions that cropped up. However, Sadguru Shree Aniruddha explained that this examination and its study is not meant to gain knowledge, but is actually to help understand how one can worship, follow and progress the path of Bhakti and in the process, improve the quality of his life, enrich it by getting rid of wrong things and thoughts. In short, Sadguru Shree Aniruddha says, this examination is meant to teach us ways to improve our ability to follow the path of Bhakti and worship in better ways. Since the year 1997, ‘Shree Sai Samartha Vidnyan Prabodhini’, under the guidance of Sadguru Shree Aniruddha, started conducting Panchasheel examinations based on Shree Sai Satcharit. There are five levels of these examinations, viz. Prathama (first-level), Dwitiya (second-level), Tritiya (third-level), Chaturthi (fourth-level) and Panchami (fifth-level). Prathama (First-level) examination is based on Sai Satcharit – ‘Chapters 1 to 10’ having four questions worth 100 marks in total. Dwitiya (Second-level) examination is based on Sai Satcharit – ‘Chapters 11 to 20’ having three questions worth 100 marks in total. Tritiya (Third-level) examination is based on Sai Satcharit – ‘Chapters 21 to 30’ having three questions worth 100 marks in total. Chaturthi (Fourth-level) examination is based on Sai Satcharit – ‘Chapters 31 to 40’ having three questions worth 100 marks in total. All the above questions, put together, add up to 200 marks in total for the practical examination for the Panchami (fifth-level). The Panchami exam as such is for 400 marks, which consists of 2 written papers of 100 marks each and practical examination of 200 marks. These examinations are conducted once every six months – in February and in August. There are no enrollment fees for these examinations. The questionnaire is published in Marathi and other regional languages in the newspaper, “Dainik Pratyaksha”, started by Sadguru Shree Aniruddha. The candidates appearing for this exam are supposed to pick the reference to the context from the tales and characters from the Sai Satcharit, the teachings from those lessons and also from the glory of Shree Sainath. The Bhaktas (candidates) are supposed to connect these references to their own or the relevant experiences of other Shraddhavans known to them and write the paper. The paper is supposed to be submitted in 20 days from the day of publication. In their answer papers, Shraddhavans also write about the work carried out by Sadguru in various areas and at multiple levels, their beautiful experiences about Sadguru and the greatness of Sadguru’s grace. This, in turn, strengthens Shraddha, Bhakti and love in one’s heart and intensifies his faith and willingness to walk on the Divine Path. The candidate’s study at home, answer their question papers and send their answer sheets directly to Shree Sai Samartha Vidnyan Prabodhini office via post or courier. Initially, these examinations were conducted at designated examination centres. Examinees were also imparted coaching for the practical examinations. 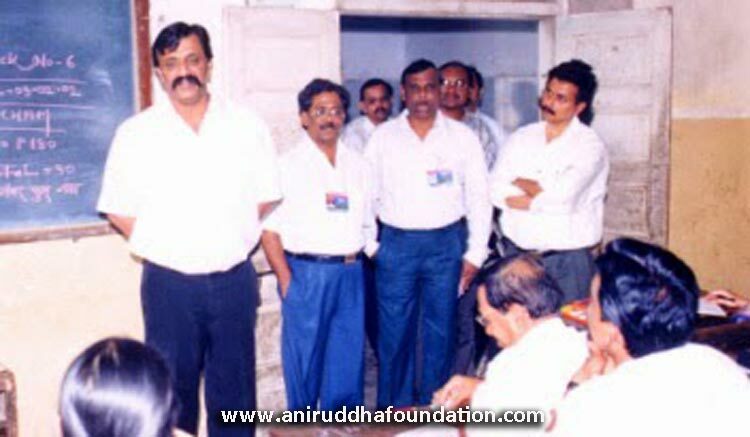 Sadguru Shree Aniruddha personally used to teach them practicals on Science and Spirituality. Our Sanstha (institution) has also published a book to guide the candidates for the Panchami examination practicals. The book describes the inseparable connection between the practical questions and various anecdotes in Saisatcharit in detail. Based on this, Panchami candidates are required to submit their completed practical’s journal book for assessment. The nature of these examinations has changed over the years. But the interest and response to these examinations have not diminished. Thousands of Shraddhavans appear for this examination every year. Candidates residing outside Mumbai as well as rest of Maharashtra and abroad are very keen to take these examinations. As a result of their continued study of Sai Satcharit, many Shraddhavans have learnt the verses from Shree Sai Satcharit by heart. They can very easily and accurately recall that a particular verse appears in a particular Chapter. This is the biggest and most important success of these examinations. These papers are evaluated like answer papers of any other examination. Candidates are given their assessment scores. While assessing the papers, the focus is not on what is written in the answer sheets, but with what sentiments have the answers have been written. A prize distribution ceremony is organized in January every year, under the guidance of Sadguru Shree Aniruddha, to felicitate the candidates who achieve special distinctions. Candidates achieving distinctions in the examinations are felicitated with a trophy (and also Certificates of Appreciation for the Panchami examination). A musical, entertainment programme and refreshments are also organized along with the felicitation ceremony. Through these examinations, Sadguru Shree Aniruddha has opened the treasure of Bhakti, Seva and Prem for the Shraddhavans. He has also unveiled this invaluable treasure for the Shraddhavans without expecting anything in return. What a blessing! This is “Sahaj Dharma”! Reading (studying) Sai Satcharit helps us to understand the lives of Bhaktas of Shree Sainath, their experiences, their demeanour and the transformation that took place in their lives due to the close association with Shree Sainath. All this opens up the beauty of the Sadgurutattva, – unmerited grace (akaran karunya), Sadguru’s love without expecting anything in return (unconditional Love) and of Sadguru Leela. These examinations introduce us to Sadguru’s Swaroop (form) – of truth, love and joy and that of sanctity (pavitrya) and Restraint (maryada). Therefore, every Shraddhavan should appear for these examinations to make their life more worthy, meaningful. Shree Harigurugram – (New English School, Bandra) – the venue of weekly Satsang (Thursday Pravachan) where a picture (photo frame) of Shree Sainath is placed for darshan. All Shraddhavans recite “Om Kripasindhu Shree Sainathaya Namah” – Jaap 24 times. 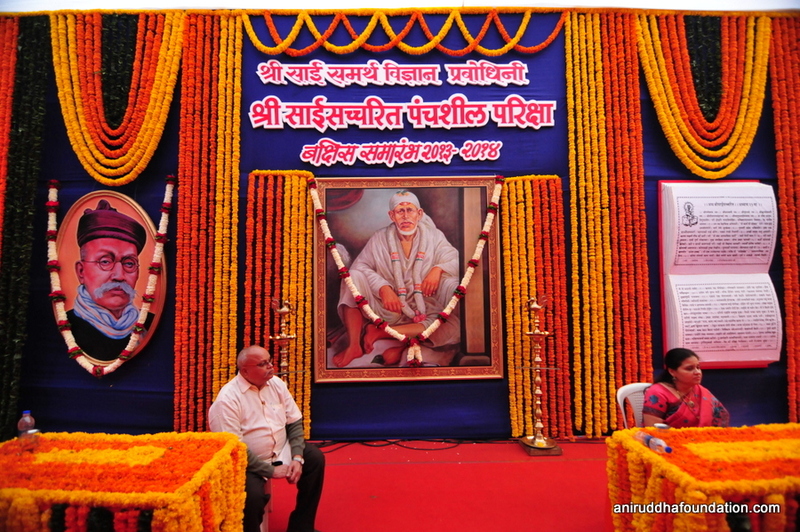 Sadguru Shree Aniruddha started his Marathi discourses with Shree Sainath’s 11 Promises (“Vachane”). His Hindi discourses also included discourses based on Shree Saisatcharit. The “Aarti” which is performed at the end of discourse includes Shree Sainath Aarti. The first Rasayatra organized for Sharaddhavans, under the guidance of Sadguru Shree Aniruddha in 1996, was Shirdi Rasayatra. Sadguru Shree Aniruddha Upasana Trust celebrates Ramnavami festival where important rituals (activities) like Shree Saisatpujan and Shree Sainath Mahabhishek are performed under the guidance of Sadguru Shree Aniruddha.